Weightlifter Zoe Smith believes the European Championships, which begin in Tel Aviv on Saturday, will form a "crucial" part of her bid to win a Commonwealth Games medal in Glasgow. The 19-year-old has not competed in a senior international since London 2012 after a series of injuries. GB Weightlifting also had their funding stopped by UK Sport in January, but that was reinstated last month. "It's a relief to be back lifting after all that's happened," said Smith. Since competing at the Olympics, the teenage lifter, who won Commonwealth bronze at the 2010 Games in Delhi, has relocated from London to Bath where she lives with her athlete boyfriend Connell Macquisten. She also spends several days a week training in Warwickshire with new trainer Sam Dovey who is a former British cyclist, and has also started coaching others herself. 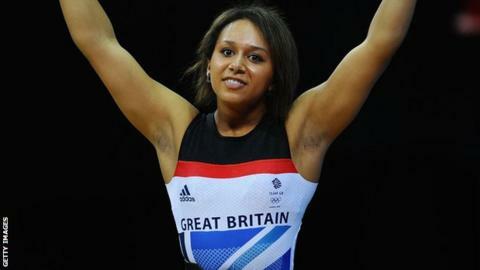 "I almost gave up weightlifting last year but this feels like a new start," she told BBC Sport. "I needed an income after weightlifting lost the [UK Sport] funding and coaching was a good way to use the knowledge I have. "With funding now back I'm now in quite a good position and I'll use the Europeans to get back into the swing of things ahead of what I hope will be a medal-winning Commonwealths." Smith finished fourth at the 2012 European Championships in Antalya, Turkey and could challenge for a podium place when she competes in Israel on Monday. However, despite a successful comeback at the English Championships in February, British performance director Tommy Yule says Smith's focus will be on the Commonwealth Games and World Championships later in the year. "If you look at previous results then there is potential for a medal, but the objective is that she enjoys the competition and keeps progressing towards this year's main events," Yule told BBC Sport. He added that it was a "great relief" the British women had earned a funding reprieve from UK Sport. "The Europeans are the first event where we can prove it was the right decision to support us and we're hoping each of the four women in the squad can achieve top-10 finishes," he said. European Youth champion Rebekah Tiler, 15, misses the event because she is focusing on her GCSE studies, but will return for the British Championships in May. WOMEN: -58kg Zoe Smith; -63kg Emily Godley and Sarah Davies; -69kg Natasha Perdue. MEN: -77kg Shaun Clegg; -94kg Sonny Webster; -94kg Owen Boxell.